Home TET TRB News PG TRB Revised Result published 6.8.14 for physics, commerce, Economics Subjects. 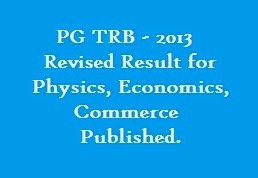 PG TRB Revised Result published 6.8.14 for physics, commerce, Economics Subjects. As per the Notification No. 2/ 2013 published on 09.05.2013, the Written Competitive Examination for the Direct Recruitment to the post of Post Graduate Assistants and Physical Education Director Grade – I was held on 21.07.2013 and results were published on 07.10.2013 and conducted certificate verification on 22.10.2013, 23.10.2013, 09.11.2013 and 17.01.2014. As per the direction of the Hon’ble Madurai Bench of Madras High Court issued on 28.11.2013 the Board revised answer keys and revalued OMR answer sheet of all the candidates and conducted certificate verification for new eligible candidates on 17.01.2014. The Provisional results and list of candidates called for certificate verification for the subjects Physics, Commerce and Economics already published on 09.01.2014 and 10.01.2014 in TRB official website are being revised now. Those who have already attended the Certificate Verification held on 22.10.2013, 23.10.2013, 05.11.2013 and 17.01.2014 are not called for Certificate Verification again and only the remaining new eligible candidates alone are called for Certificate Verification. The certificate verification is scheduled to be conducted on 14th August 2014 at Government Girls Higher Secondary School, Villupuram. This Certificate Verification exercise is subject to outcome of Writ Petitions / Writ Appeal if any filed before the Hon’ble High Court of Madras and Madurai Bench.